Reno 2009 – What if..? Frank Mormillo returns to Duxford to provide coverage of the airshow every warbird fanatic wants to attend. Few shows can claim to rival the depth and diversity that is provided by England’s premier warbird airshow. There have always been heros in air racing, and those personalities have always been ready subjects for journalism. Just as interesting is a story of how these larger than life people can affect the path of a child’s future. Steve Hanshew shares a unique story from the golden age of air racing. 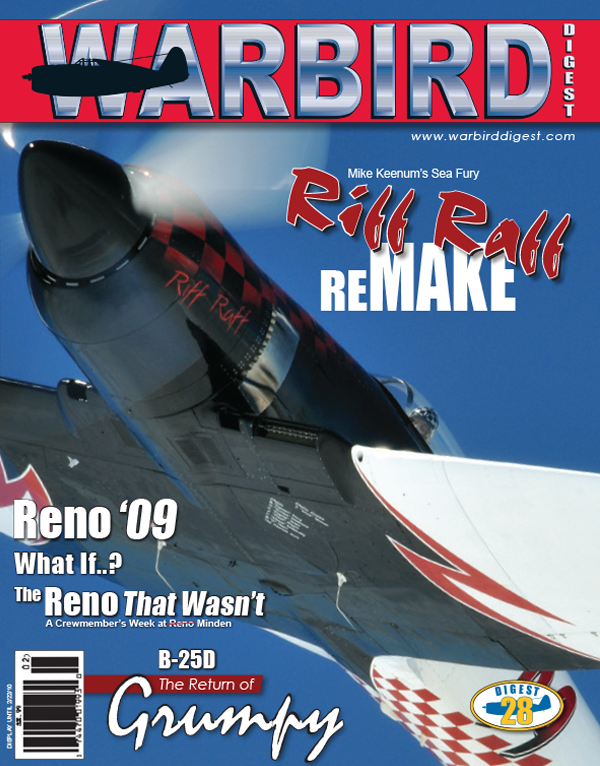 Scott Germain writes a fantastic review of the 2009 air races, guided by the in-depth coverage of Jarrod Ulrich. Together they provide a Reno synopsis second to none. As the story unfolds you can almost imagine being there. Scott Germain tells a story that epitomizes the dedication of racing crews. He chronicles the efforts of The Galloping Ghost racing team and owner Jimmy Leeward, to attain the unattainable. Scott was there, not as a journalist but as an official member of the team. When John Sessions acquired the B-25 Grumpy from Vulcan Warbirds, he conspired to revisit history on an adventurous return. Grumpy and the dedicated crew flew the same route used by ferry pilots when delivering aircraft to Europe during World War Two. Arguably the most unique location of any U.S. aviation museum, the Tillamook Air Museum houses their unique collection in an enormous World War Two era blimp hangar. The pride and joy of Tillamook are their World War Two Pacific Theater fighters—a rare P-38 Lightning and an even more rare Japanese Oscar.